I'm quite excited, we have three awesome giveaways coming up, so I'm thinking one per week for the next three weeks. I love randomly winning stuff on the web and can't wait to offer a few things to my readers. Hi Shannon! I came across your blog just yesterday and immeadiately added it to my favourites list. I can't wait to try some of your wonderful ideas with my 7yr old twin girls. I think they are going to love it :) I'm off to Target today to look for some of those divided containers you use. This looks like a fun book too, thanks for the chance to win. I found your blog the other day and I love it. My daughter is 2.5 so we don't make lunchbox lunches often, but this would be great for a picnic and I know making school lunches will come sooner than I think. So I would love to have this book! That looks like an adorable book! I'm already a fan of your FB, so I can't enter that way...bummer man! Hi, Just found your blog and I love it! You are really inspiring me to make fun lunches for my kids. Thanks! Ooo I am so jealous! I have been wanting that book for awhile :D It looks so cute!! Love finding other Bento moms! Thanks for the inspiraton! Hi, I want to be entered! I follow you on your blog and on facebook. Hmmm, I think my only idea is that the dollar store has a lot of cute things you could use. Cute cutters, baggies, bags and containers. Aw sweet. I've never heard of those books but I am going to check them out! I love bento lunches. I just need to get my stuff together to make it a little easier to do. Your site is so inspiring! I love your blog & follow on fb. I would love a copy of that cookbook - such inspiration! My son is starting kindy in the summer (he's going to be enrolling in a school with a year-round calendar, hence the early start!) and I am loving on all of the great ideas you have. 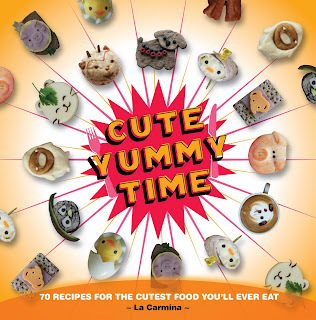 I think Cute Yummy Time would be a great way to start his year off with some mama-love tucked into every lunch! Aaand now I'm following your blog, as well! Ta da! 3/4...not too shabby! Thanks for the opportunity! Love your blog!!! :-) I am also a follower on facebook! Yea! Love it. That book looks so cute!!! and now a "like" on facebook (I hate that you can't "fan" anymore... so silly). You don't know how bad I need this book. With one autistic picky eater and the other who wants marshmallow fluff and peanut butter everyday, this book would be a lifesaver. I guess I'll have to se if Amazon has it. They have everything, right? What a great idea this book is. I need more inspiration for lunches--this would help! Recently, I discovered your blog...instanly i was hooked, line and sinker. I am inspired by your creations and love trying to recreate them. My son loves my new found creativity! Would love the book to compliment my new addiction! I would love to win!! Hi!! Lol and entry number two!I have been following you for a long time! and here goes three!! I am a face book follower too!! So cute! That looks like an awesome book. Hey there, came across you blog yesterday, what fun. And we also live in Dallas - I have added you to my blog list! The book looks like fun. Oh, for our son's school lunches I purchased a Laptop Lunchbox, it is spendy but it has been great. Check out laptoplunches.com (if you haven't already) - great site with products and lunch ideas. I just found your blog, and even though we don't have kids (yet!) I ordered bento lunchboxes for my fiance and I to take to work with us (and I'm super excited to try out some of your recipes!). I love your blog! I love your blog. We are learning to make yummy waste-free lunches at my house. I love your muffin ideas. I made peanut butter/banana/chocolate chip muffins last night, and they are all gone already! I will go do some of your other entry stuff too. Thanks for having a great blog! now I am a follower of your blog! I want little salami people too. I also have two more wee ones at home and am sure they'd love to be my test kitchen as we proceed. Hi- I linked to your blog from "Fed up with school Lunch". I have no tips to share (that's why I read your blog!) Your blog has inspired me to do little things to make my kids meals more creative and use some of the (small) bento supplies I have. What a neat looking book ... would love to add that to my library to provide some fun ideas for my little ones. I am a fan on Facebook too. Hey Shannon! What a cute book! I'll throw my hat in. I'm following your blog and facebook as well. Love your blog. Great ideas for what I should put in my preschooler's bento box. She is super picky, so I am always looking for ways to entice her into eating yummy healthy foods. I found your blog and love it! i'm thrilled that I found your blog today...i have a lot of reading to do! my kids would devour all these cute things - at least, that's what I'm hoping! I'm going to have to start packing lunches in the Fall and was looking for inspiration. After a google search I found your blog. Then I realized we are on a mom's board together. :) I'm now a fan on facebook also. Follower!! Been following you for a year or so and you've been awesome! Looks like a great book! My little one is in kindergarten, and it seems after just a year of packing lunches, they are getting "boring." I'd love some ideas to help me make them more exciting! What a fab blog. Ideas are so hard to think of when in a rush so it is always great to know I can come check your blog for some inspiration! My son is turning two this week, and I'm storing up ideas for when he goes off to pre-school. I follow on face book. You make me want to pack lunches! I love your blog. Thanks!